The Southern Illinois University Edwardsville School of Nursing and SSM Health today announced a new arrangement to offer two online Master of Science nursing degrees to SSM Health nurses, beginning in January. Under the agreement, online Master of Science-Nurse Educator and Master of Science-Health Care and Nursing Administration cohort programs will be available to nurses at SSM Health across its four-state region, which includes Illinois, Missouri, Wisconsin and Oklahoma. The announcement marks the first time the SIUE School of Nursing has offered its online master degrees as a cohort program to a health system. While SSM Health has nursing cohort programs with other universities, this is the first time the organization has offered a system-wide MSN program to its nurses. As part of the program, the two organizations have collaborated to offer qualified SSM Health nurses discounted tuition and a convenient payroll deduction option for tuition payments. Both MSN programs comprise 11 courses, with the Nurse Educator degree including 270 hours of clinical experience and the Health Care and Nursing Administration program including 315 hours of clinical experience. The MSN program builds on a collaboration established in 2015 when the SIUE School of Nursing and SSM Health combined to offer an accelerated RN to Bachelor of Science nursing degree to SSM Health nurses. To date, nearly 60 nurses across SSM Health have graduated from the bachelor’s program, with more than 170 nurses currently in the program. The expansion of this collaboration will support nursing leaders in achieving advanced degrees at a significantly reduced cost. Qualifying SSM Health employees are eligible for tuition reimbursement. SIUE’s nursing programs allow for accelerated degree completion and provide flexible course progressions for working adults. Being an online student means nurses have flexibility on when and where coursework is completed. For more information, visit siue.edu/corporate/ssm. The SIUE School of Nursing’s fully accredited programs are committed to creating excellence in nursing leadership through innovative teaching, evidence-based practice, quality research, patient advocacy and community service. Enrolling nearly 1,400 students in its baccalaureate, master’s and doctoral programs, the School develops leaders in pursuit of shaping the nursing profession and impacting the health care environment. SIUE’s undergraduate nursing programs on the Edwardsville campus and the regional campus in Carbondale help to solve the region’s shortage of baccalaureate-prepared nurses and enhance the quality of nursing practice within all patient service venues. The School’s graduate programs prepare nurses for advanced roles in clinical practice, administration and education. SSM Health (ssmhc.com) is a Catholic, not-for-profit health system serving the comprehensive health needs of communities across the Midwest through one of the largest integrated delivery systems in the nation. With care delivery sites in Illinois, Missouri, Oklahoma and Wisconsin, SSM Health includes 20 hospitals, more than 60 outpatient care sites, a pharmacy benefit company, an insurance company, two nursing homes, comprehensive home care and hospice services, a technology company and one Accountable Care Organization. With more than 9,500 providers and 35,000 employees in four states, SSM Health is one of the largest employers in every community it serves. An early adopter of the electronic health record (EHR), SSM Health is a national leader for the depth of its EHR integration. For more information, find us on Facebook and Twitter. 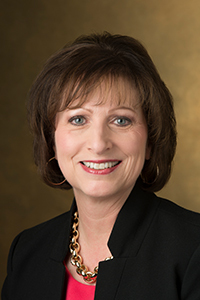 Photo: Laura Bernaix, PhD, RN, dean of the SIUE School of Nursing.